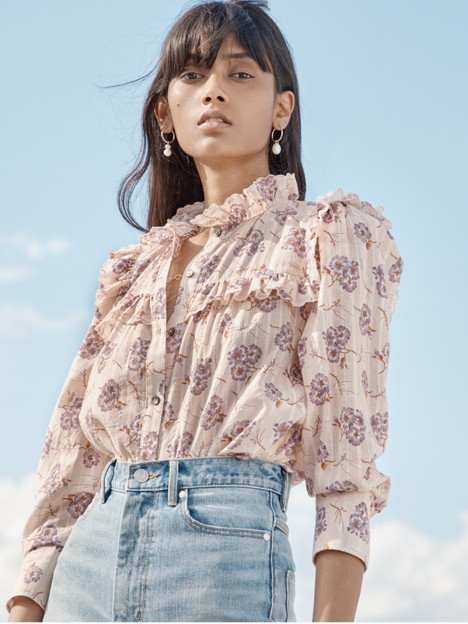 Cut in a V-neckline and trimmed with ruffles, feminine details balance out a Western-inspired spirit on this long-sleeve denim top. Cut in a V-neckline and trimmed with ruffles, feminine details balance out a Western-inspired spirit on this long-sleeve denim top. Its voluminous sleeves lend a modern shape while its buttoned cuffs can be rolled up or worn down. Pair it with jeans for a double-denim moment or let it lend a ruffled accent layered under a cozy V-neck pullover.